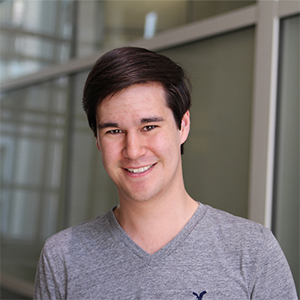 Will Crouch's research will focus on unmitigated communion (UC), which is defined as an unhealthy personality trait that can be characterized in individuals who consistently reject their personal needs in favor of helping others excessively. He will analyze how individuals with higher levels of UC react to receiving support compared to individuals with lower UC levels. Crouch will explore if relationship intimacy moderates these reactions and draw conclusions on the relationships between UC, psychological distress and relationship intimacy. Crouch was first introduced to social psychology and gender psychology after joining Psychology Professor Vicki Helgeson's lab as a research assistant. His work focused on UC, which is what initiated his interest for his thesis project. He has remained a member of Helgeson's lab and continues to become more involved in the administration of the lab's studies. His experience has helped him understand the field and literature that is relevant to UC and various illness-related coping strategies.